High-speed video image of the MAST plasma obtained at the start of an ELM. MAST, the Mega Amp Spherical Tokamak, is the first experiment to observe finger-like lobe structures emanating from the bottom of the hot plasma inside the tokamak's magnetic chamber. 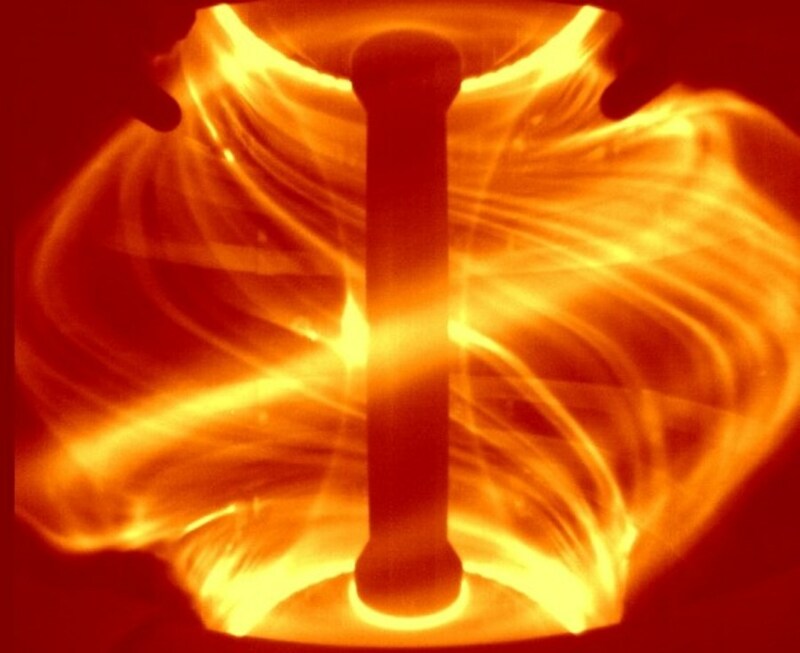 The information is being used to tackle a harmful plasma instability known as the edge localized mode, which has the potential to damage components in future fusion machines, including the key next-step ITER device. Edge localized modes (ELMs) expel bursts of energy and particles from the plasma. Akin to solar flares on the edge of the Sun, ELMs happen during high-performance mode of operation ("H-mode"), in which energy is retained more effectively, but pressure builds up at the plasma's edge. When the pressure rises, an ELM occurs—ejecting a jet of hot material. As the energy released by these events strike material surfaces, they cause erosion which could have a serious impact on the lifetime of plasma-facing materials. In this photo the top right hand corner has been expanded to highlight the similarity of the ELM filament with a solar eruption. One way of tackling the problem is ELM mitigation—controlling the instabilities at a manageable level to limit the amount of harm they can do. MAST is using a mitigation technique called resonant magnetic perturbation; applying small magnetic fields around the tokamak to punch holes in the plasma edge and release the pressure in a measured way. This technique has been successful in curbing ELMs on several tokamaks. 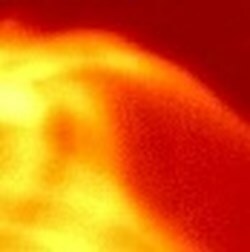 The lobe structures that have recently been observed in MAST are caused by the resonant magnetic perturbation, which shakes the plasma and throws particles off course as they move around the magnetic field lines in the plasma, changing their route and destination. 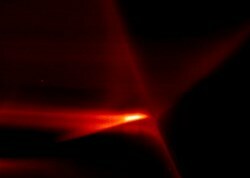 Some particles end up outside the field lines, forming finger-like offshoots near the base of the plasma. Changing the shape of a small area of the plasma in this way lowers the pressure threshold at which ELMs are triggered. This should therefore allow researchers to produce a stream of smaller, less powerful ELMs that will not damage the tokamak. First predicted by US researcher Todd Evans in 2004, the lobes—known as homoclinic tangles—were seen for the first time during experiments at MAST in December 2011, thanks to the UK tokamak's excellent high-speed cameras. CCFE scientist Dr Andrew Kirk, who leads ELM studies on MAST, said: "This could be an important discovery for tackling the ELM problem, which is one of the biggest concerns for physicists at ITER. The aim for ITER is to remove ELMs completely, but it is useful to have back-up strategies which mitigate them instead. The lobes we have identified at MAST point towards a promising way of doing this." The lobes are significant for another reason; they are a good indicator of how well the resonant magnetic perturbation is working: "The length of the lobes is determined by the amount of magnetic perturbation the plasma is seeing," explains Dr Kirk. "So the longer the 'fingers,' the deeper the penetration. If the fingers are too long, we can see that it has gone too far in and will start to disturb the core, which is what we want to avoid." The next phase of the research will involve developing codes to map how particles will be deposited and how the lobes will be formed around the plasma. 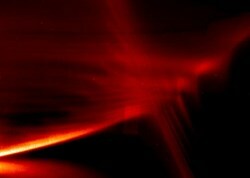 ... and with resonant magnetic perturbation, showing the finger-like lobe structures emerging from the edge of the plasma. "We already have codes that can determine the location of the fingers but we cannot predict their length due to uncertainties in how the plasma reacts to the applied perturbations. Our measurements will allow us to validate which models correctly take this plasma response into account," said Dr Kirk. "New codes will mean we can produce accurate predictions for ITER and help them tame the ELM."